Isoblue HiFi has over 35 years experience in the UK HiFi industry producing HiFi furniture designed and manufactured in the UK. 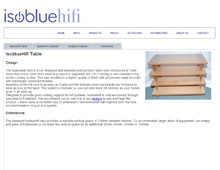 Isoblue Hi Fi customers can choose from various different finishes made from real wood veneers which are all listed on the Isoblue Hi Fi website. The Isoblue HiFi racks have seen many production upgrades since it was launched in 1999. Hi Fi shelves can be added with extension packs to add more shelves as and when required. The modular HiFi stands are designed to be striking pieces of furniture whilst being practical too. Isoblue HiFi sell their products through UK and international dealers only, all of these are listed on the Isoblue HiFi website.